It’s been another busy Friday here at CWE towers filled with presentations, meetings and lots of crucial tea making. A few weeks ago, two members of our Leadership team, Rachel and Gavin, headed over to Croesyceiliog School in Cwmbran to discuss career options with the current year 11 students. At first, speaking to approximately 270 students seemed to be quite daunting for our duo, however with the positive response from the students and help from Liz at Golley Slater, the presentation went without a hitch. The presentation looked at three different aspects of seeking out an apprenticeship. Firstly, Dean Stephens from our training provider, Coleg QS, took to the stand to discuss the academic side of apprenticeships and how to obtain funding. Our very own Gavin Cook went on to discuss his time as an apprentice and the journey he went on as a school-leaver into his time working and training with CWE. 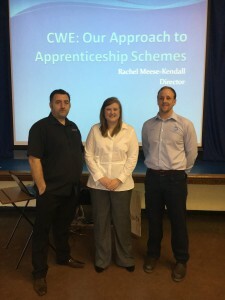 Finally, Director Rachel Kendall went on to discuss the history behind the CWE apprenticeship scheme and the career options that are available in both the electrical and administration departments. It was a great morning, with really positives outcomes which resulted in a number of enquiries from potential new students. We would like to thank Golley Slater for involving us in this Welsh Government project; it has been really humbling being able to speak to the students and hopefully inspire their future career options. We would also like to say a big thank you to Dean and the team at Coleg QS for taking the time to attend and give a presentation with us. Also, a big thank you to Gavin and Rachel for sharing their stories of CWE with students. On Monday, Rachel will be speaking in a panel discussion for the Capita Conference for Apprenticeships and Traineeships in the Hilton Hotel in Cardiff. Rachel, alongside representatives from BT and Deloittes will be looking at the different business models of SME’s and Large-Macro businesses and their different perspectives on the growth and expansion of Apprenticeship programmes. Apprenticeships and learning have always been a passion of CWE’s and they are values that are ingrained into the company culture. I think Abraham Lincoln says it best, “The best way to predict the future, is to create it”, definitely words we live by here at CWE.